If you were asked to name as many birds with only one syllable in it’s name, how many would you be able to come up with? 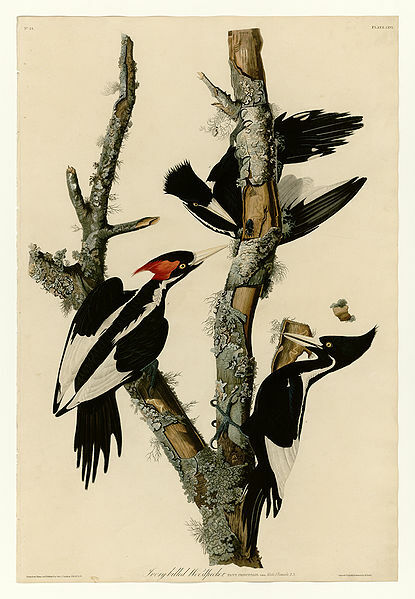 And I’m just speaking about North American birds. The only one I could come up with is Philomachus pugnax, the one and only “Ruff”. 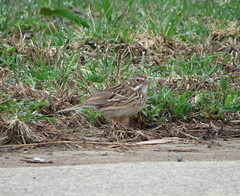 An ABA code 3 bird that certainly sparked a lot of interest since it was first sighted early Friday. 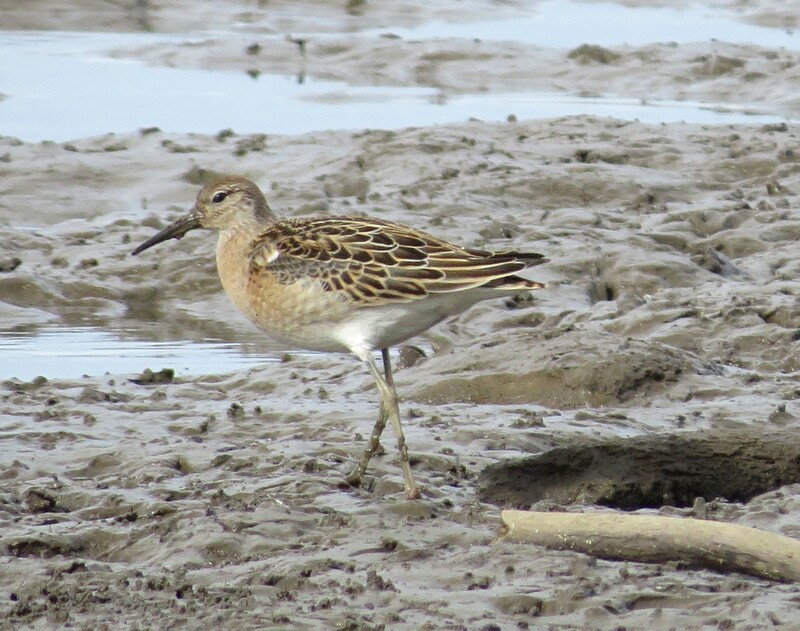 A casual Eurasian visitor to Ohio, the Ruff usually makes an appearance during the spring and fall during migration. According to Bruce Peterjohn in “The Birds of Ohio”, most fall migrants are during August and September, with only 2 in October and 1 in November recorded. The majority of the sightings are up on Lake Erie, with only a few in the interior of the state. So needless to to say when on Friday one was sighted at Hoover Reservoir north on Columbus near Westerville Ohio my heart skipped a beat. The construction of Hoover Reservoir started in 1953, and completed 2 years later. Built to hold back Big Walnut Creek this 3,272 acre lake is 8 miles long, and 1 mile at it’s widest, it’s where the majority of Columbus’s drinking water comes from. At the very northern part sits the cute little town of Galena Ohio, with it’s famous mudflats, and equally famous boardwalk. The boardwalk is 1,500 feet in length and a mecca for birders and fishermen alike. As a matter of fact my lifer Buff-breasted Sandpiper was seen from the very end of the boardwalk. However yesterday it still remained closed due to ice damage from last winter, so a different tactic was used to track down the Ruff. As with so many reservoirs, existing roads that criss-crossed the area now become dead-ends. The only way you can tell now-a-days that they even existed is the crumbling asphalt left behind. 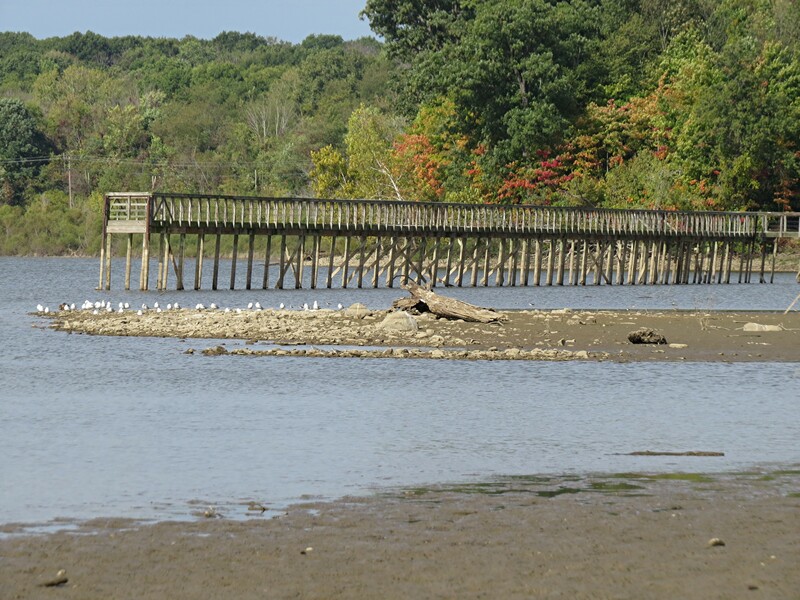 And there is one such abandoned road that runs out of Galena right into the mudflats just a few hundred yards from the boardwalk. So at 9:30 yesterday morning I parked the bird-mobile along the side of the road and started to unload. The temptation to run up Friday late afternoon after work was strong. Driving time during normal conditions was 1 hour and 45 minutes, but this was Columbus and I would be driving through at rush hour, with a Ohio State home football game the next day. I reluctantly opted for Saturday morning to make my trip. As I started down the heavily grown over road I noticed a couple coming towards me. 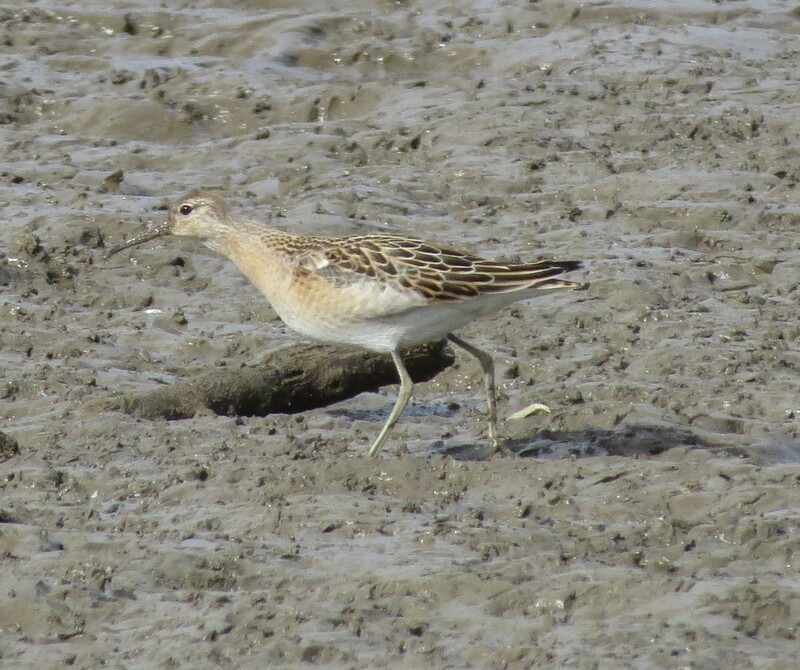 I asked if the Ruff was still there, which he confirmed it was, just a little further out. My pace quickened. A short 5 minute hike brought me to a clearing where 5 birders were stowing their gear as they prepared to leave. 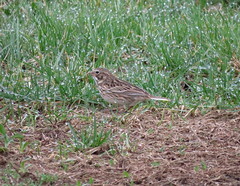 As I approached 2 guys who were set up on the edge of the mud, I asked in what area the bird was seen last. 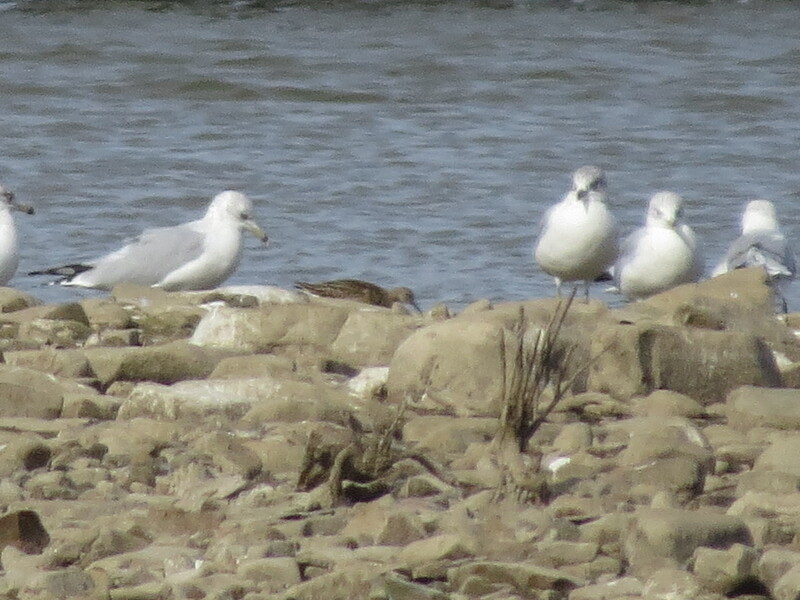 The 2 men pointed me in the direction of that rocky point of mud where all the gulls are sitting. “The Ruff is on the other side down at the waters edge feeding, so you have to wait a minute for it to come out”. Not exactly the view I’d prefer, but I’ll wait and see if it comes closer. 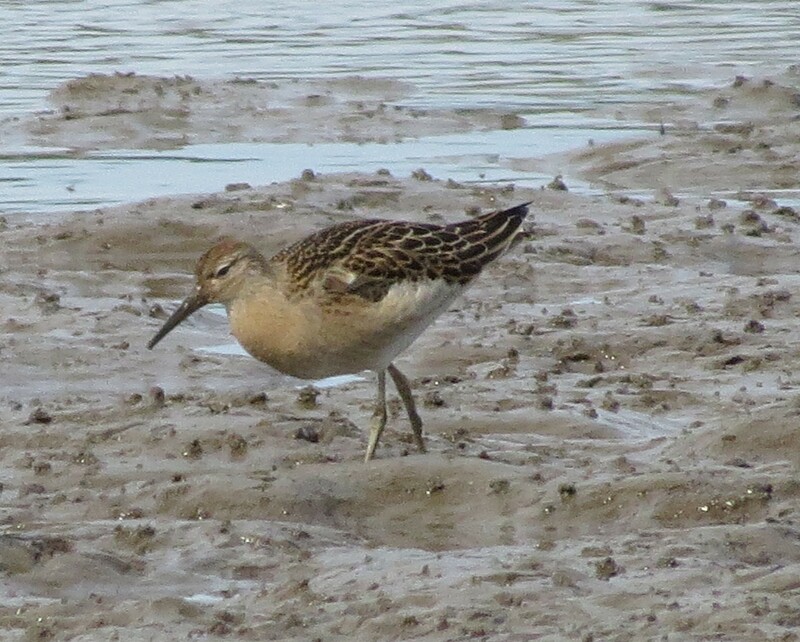 My first look at the Ruff. Not very impressive. Also feeding on the mudflats were lots of Lesser Yellowlegs, and Pectoral Sandpipers, Killdeer, Semipalmated Plovers, and Spotted Sandpipers. 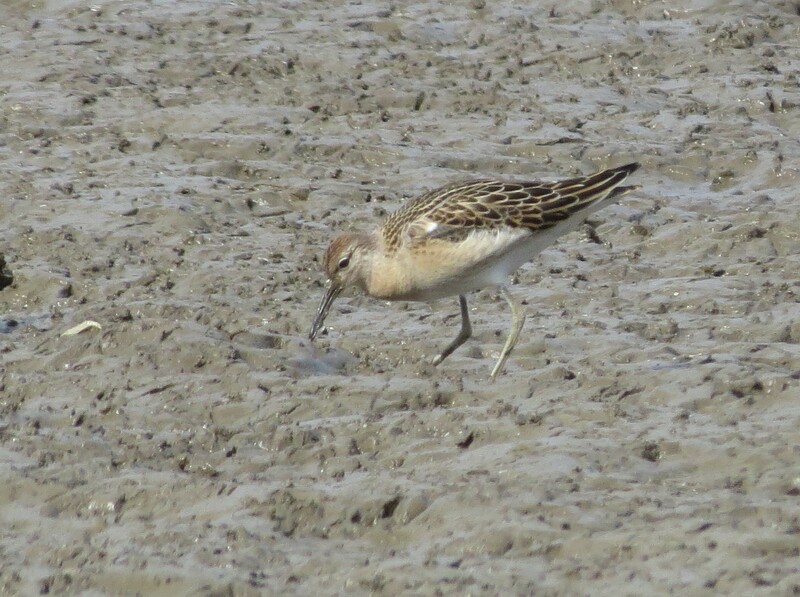 After waiting about 20 minutes a large portion of birds took off and the Ruff was one of them. 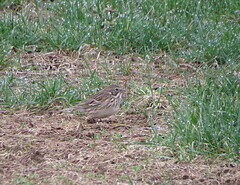 You could easily pick it out from the other birds as they circled around the area and finally settled back down closer than they were before. 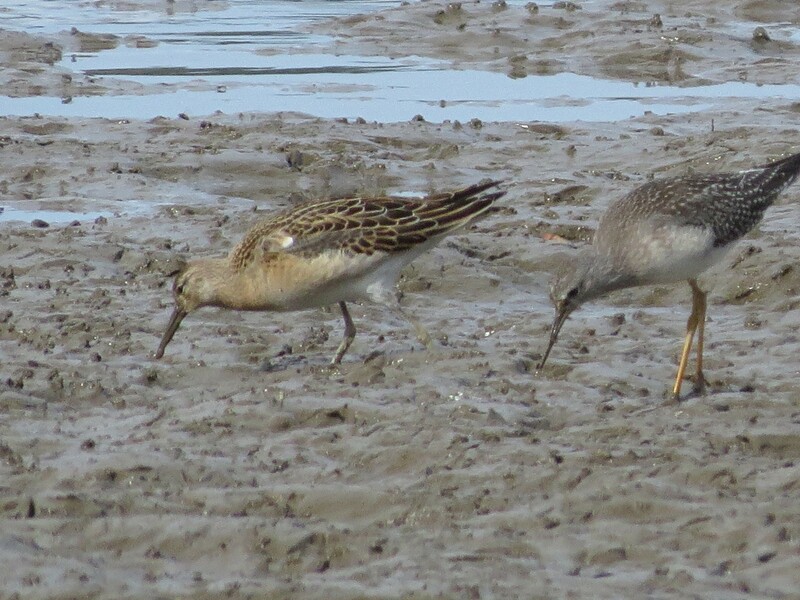 This time I was able to get my scope on the juvenile Ruff and noticed the buffiness and size comparison to some of the Lesser Yellowleg. 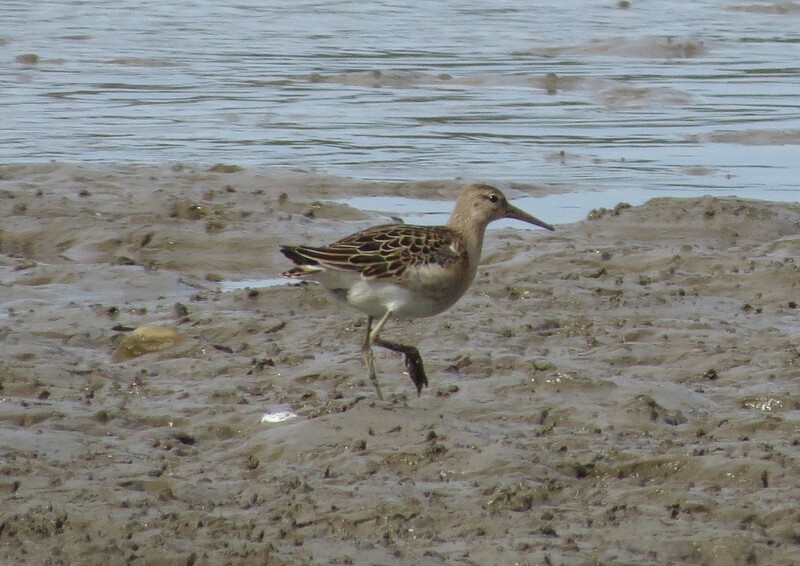 Then the Ruff started to move closer as it constantly probed the mud in search of food. The sun broke through the cloud cover which helped as I started to click off picture after picture. 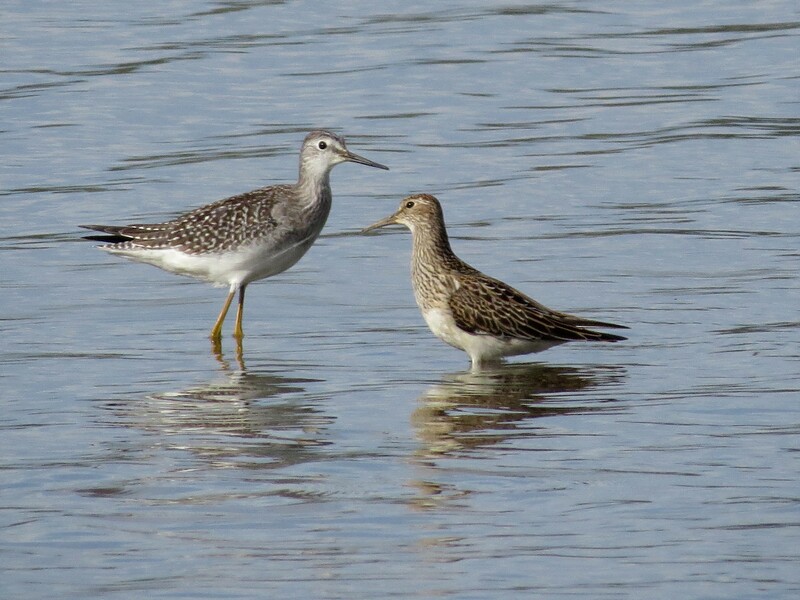 Normally found along with Yellowlegs and Pectoral Sandpipers, I wanted to get a size comparison photo with a Lesser Yellowleg. As you recall one of my target birds while visiting the Sleeping Bear Dunes area was the Piping Plover. Which as it turns out was a success, as I got some really good photos of the Plover. As life returned to normal after returning home I started to think about the Plover I watched all by myself on that deserted stretch of beach. I wasn’t satisfied with just observing and photographing the bird, I needed something more. It wasn’t enough sharing my story with you my readers, I wanted to see if others might be interested in this sighting. Being a Federally Endangered Species surely someone out there would be interested. So I sat down in front of my computer and started to search. 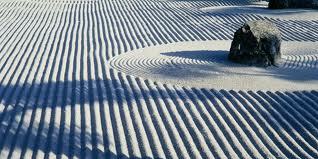 After a while of searching one link to another from various web sites I settled upon the U.S. Fish and Wildlife Service out of East Lancing Michigan. So I gave them a call. After being transferred a couple of times I ended up talking to Vince Cavalieri, a Wildlife Biologist with U.S. Fish and Game. We talked for a bit and he was very interested in my photos. 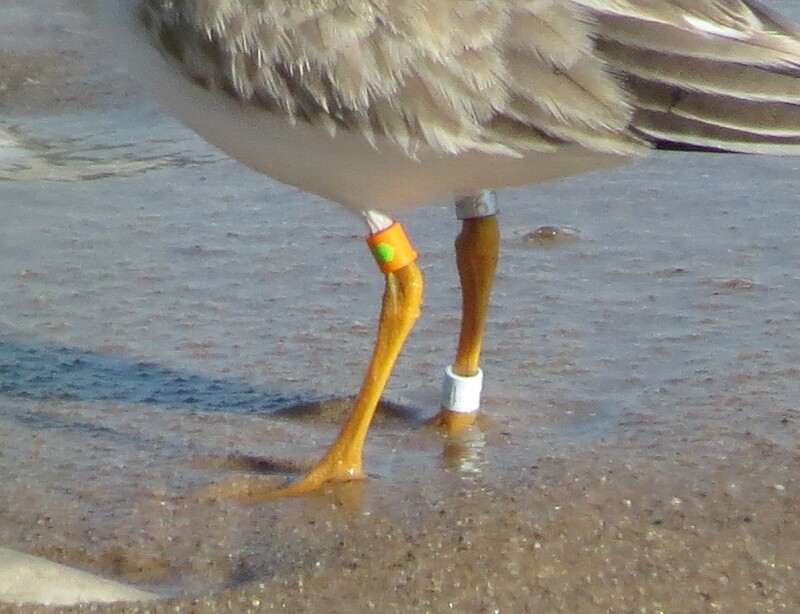 So he gave me his e-mail address and I’d crop the photos so he could look at the bands on the Plover legs. These were the 2 photos I sent Vince. 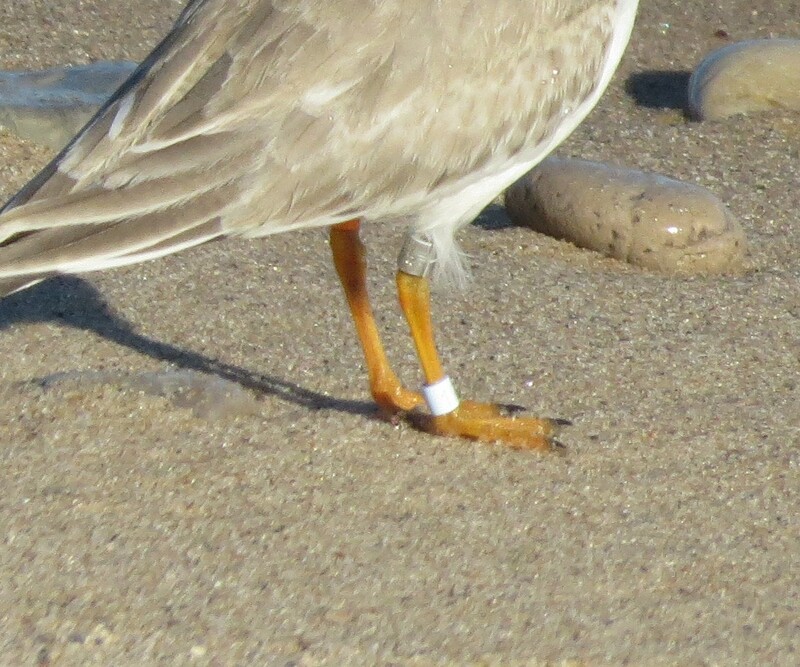 Having taken loads of pictures of the Plover I needed to select photos that showed both legs and the bands on each. I waited for a few days and I finally got a reply, but not from Vince. It seems he passed my pictures along to another individual names Alice Van Zoeren. Her response was pretty straight forward. The bird was hatched this Summer on North Manitou Island. The Manitou Islands sit off to the west of the Leeanau Peninsula and is maintained by the Sleeping Bear Dunes National Lake Shore. There is a small colony of the Great Lakes population of Piping Plovers that nest on North Manitou Island annually, and Alice is part of a larger group that monitors the Plovers 24/7 during nesting season. A free-lance naturalist with a degree in Natural History Education from the University of Michigan, she now employed the the University of Minnesota as a Research Assistant. Each Summer she’ll spend 4-5 day shifts on North Manitou Island monitoring and protecting the nests which are concentrated in the Dimmick’s Point area of the Island, which is closed to the public from April to August. She told me that there were 17 pairs of mating adults on North Manitou this year with 42 chicks fledged, with my bird one of the 42. All told the Great Lakes Population increased this year to 75 mating pairs from a low of 13 back in the 1980’s. She provided a great link if you’d like to read more about this beautiful bird, and the efforts they put forth to preserve them. Brian Wulker reported a lone Buff-breasted Sandpiper at the rear pond prior to Lost Bridge. Wilderness Road in Stark has been host to loads of these birds the past several days and it seems it’s our turn for a few of these beautiful birds here in the southwest corner of the state.